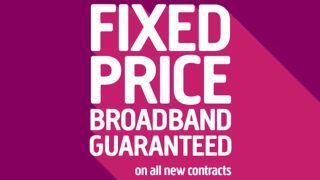 In the wake of BT broadband putting up its prices mid-term (yet again), Plusnet has swooped in with an announcement to set folk at ease with fixed price contracts. Yep, the internet provider will now guarantee its contract prices for all broadband deals. The important thing to note here is that not only will the broadband price stay fixed, but the line rental will, too. So even if BT does decide to bump charges yet again, you'll have a safety Plus-net (sorry!). This applies to both residential and business contracts for customers that are new, who are signing up again or who are changing their broadband option. That spans options that include ADSL, fibre and even faster fibre. And if you're thinking that all sounds quite familiar, then it might be because Plusnet is taking its cue from TalkTalk who has been keeping prices fixed for a little while now. What are the best Plusnet broadband deals? We're glad you asked. And the good news is that Plusnet broadband deals are some of the cheapest on the UK market. The cheapest plan is its Unlimited Broadband at £19.99 per month on an 18-month contract and a new, tasty £50 cashback offering. Step up the average speed to 36Mb Unlimited Fibre and you're going to pay £23.99 a month on an 18-month contract. Or go for the tip-top 66Mb Fibre Extra from £28.99 per month on that same 18-month stint. So where an 18-month contract may have previously been a dirty phrase, it's now got a positive appeal thanks to this fixed-price guarantee throughout that time. Cheers Plusnet! Check out our comparison chart below or head to our broadband deals page to see how the likes of Sky, Virgin and Vodafone are doing on the pricing front right now.